Welcome! 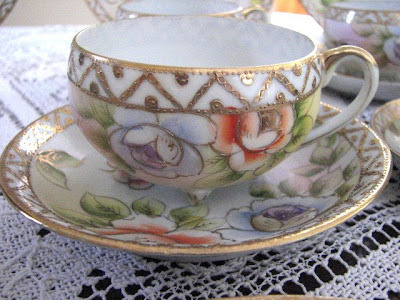 Kim at The Victorian Parlor is having a Tea Party today : ) Please drop by for a visit. I have my best lace and linen on display . . . . This little Nippon Tea Set is so sweet . . . it has a matching cookie platter and plates. 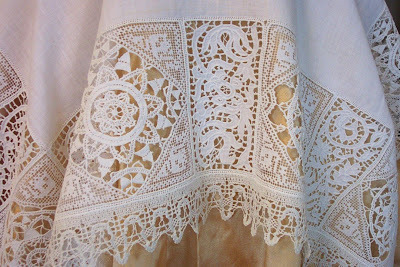 I think Italian Lace is so pretty! This one is a beauty. 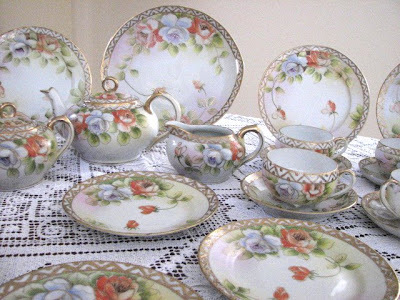 My Favorite tea set has 40 pieces ~ luncheon plates, dessert plates and cups and saucers. The teapot is very small though . . . so we'll have to be patient. The cups have the cutest little feet . . . hard to see here but each cup has three tiny feet. 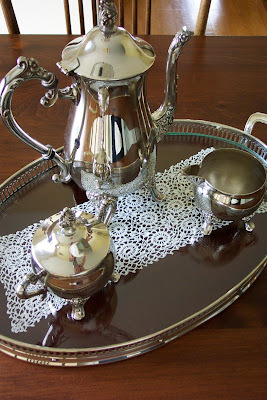 I do have lots of other tea sets so I am sure I can find a larger tea pot if needed, LOL. Why I just love all your "tea" things, so precious! It's so nice to see what everyone else has!!! Enjoy visiting! Oh my gosh-your tea set is gorgeous!!! And those linens are wonderful too:). Thank you so much for being a 'co-hostess' for the tea party today-I thoroughly enjoyed having tea with you:)! Everything is just so lovely! Thank you so much for the tea. It was so nice meeting you! I wanted to come by and meet you and say hello! Your china is so very beautiful. This is such fun being a part of a virtual tea party. Hope you'll stop by and have tea on my porch with me. 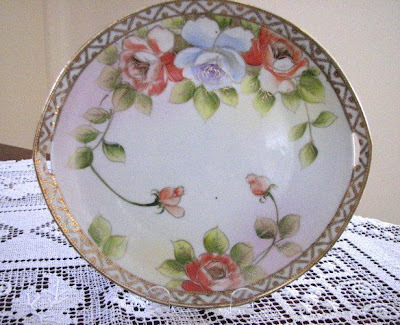 You have lovely china and linens! I think the tea party was just wonderful and everyone had such beautiful photographs. I really enjoyed my visit! 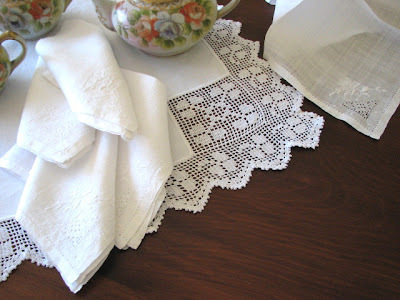 Love your beautiful lace and linen and the little tea set with the feet is so pretty. Oooooo!! Can I come and meet you Karen and stay for a cuppa. 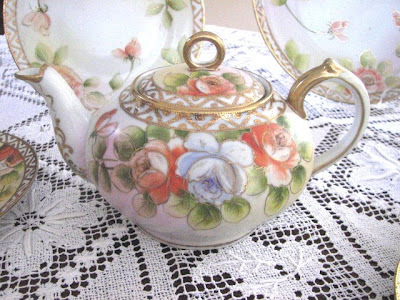 I would love to play ladies and have tea using your beautiful tea set all set out on your gorgeous lace. I would get to meet Cider too. OH! 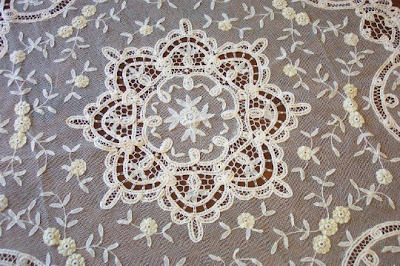 I am drooling over all that beautiful lace! Don't mind me! LOL! Thank you for the lovely tea.....your tea sets and lace were exquisite! Oh I can't thank you enough for using your best linens and china just for us tea tasters!!! You make us feel so special! I've never sipped from Nippon...you made me feel like a queen. I enjoyed my visit, now I'll have to come again and catch up with you, your place is very lovely! Oh, your lace and silver set are just so beautiful. And the pink rose just sets the right tone for it all. Thanks for tea! Your dishes are so lovely...and your Italian laces are very pretty. 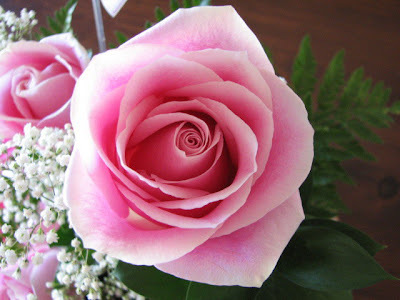 Love the rose..beautiful. thanks for sharing your lovely Nippon... really beautiful. I am stopping by your etsy shops to add them to my favorites. Your lace and linens are just Exquisite! Do pop in for tea, the side gate is still open. What an absolutely lovely tea set.